"[Skolas] docked Peekis' arms and demoted him to Dreg as punishment for his recklessness." 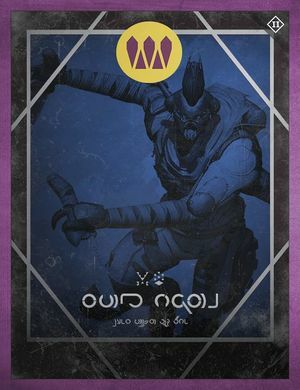 Peekis, the Disavowed is a former noble of the House of Wolves. He commanded Skolas fleet at the Eos Clash during the Reef Wars, and succeeded in killing Skolas' rival, Irxis, Wolf Baroness. However, it was a Pyrrhic victory, as most of Skolas' fleet was destroyed. Outraged by the losses, Skolas had Peekis demoted to Dreg, and docked his arms and cut his Ether ration. Eager to prove himself, Peekis longed to return to his former glory. During the Wolf Rebellion Peekis fled to Venus, taking up residence near The Citadel. He was slain by Glimmer-hungry Guardians on orders of the Queen's Wrath, Petra Venj.